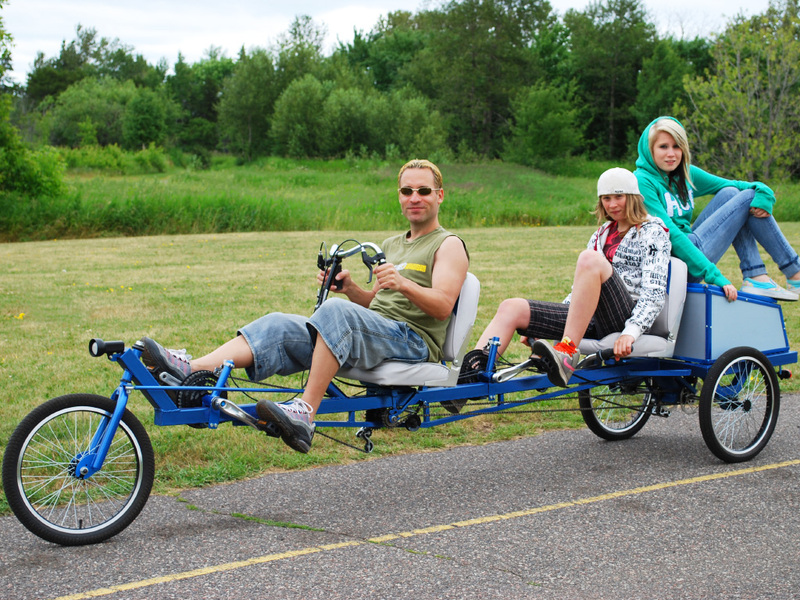 Build A Tandem Cargo Trike To Replace Your Car! 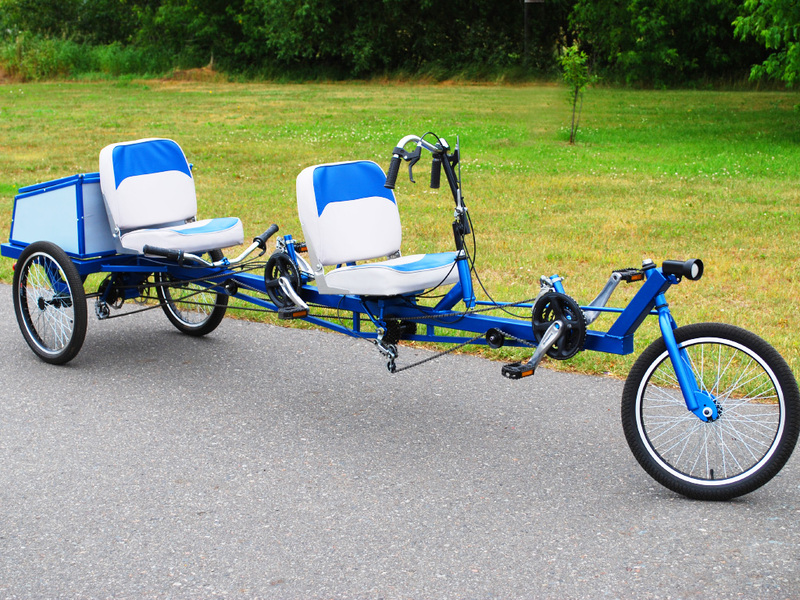 This DIY tandem cargo delta trike extends the original LodeRunner, creating a unique tandem cargo trike that includes a fully independent transmission that allows each rider to set his or her own gear and pedal at their own pace. 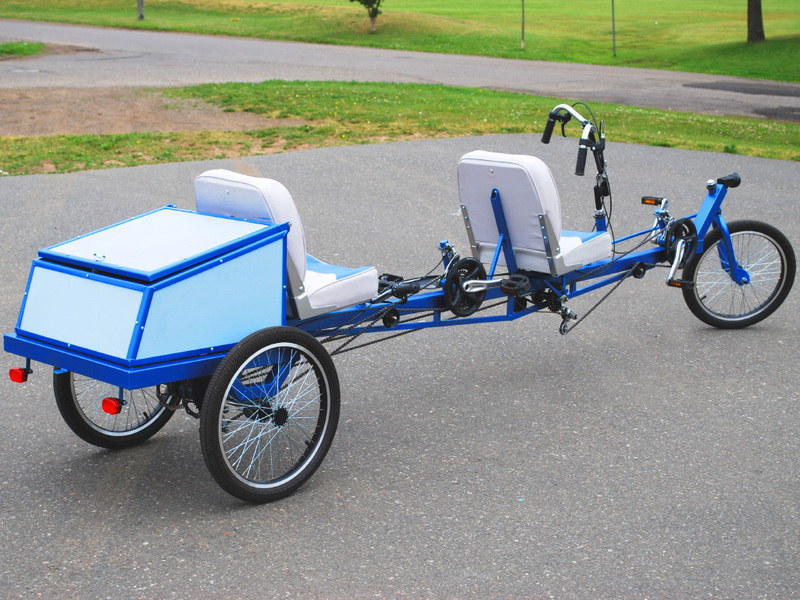 The completed LodeRunner2 is a smooth riding tandem trike capable of carrying hundreds of pounds in a highly adaptable cargo bay. If you have been looking for a way to use your car a lot less, then this human powered vehicle can be a real alternative. This DIY Tandem Delta is a Human Powered SUV. The unique dual independent transmission system gives each rider their own selection of 26 or more gears, and each rider can pedal at their own pace and effort without affecting the other rider. One rider can even stop pedaling altogether. The adjustable recumbent seating is both comfortable and highly efficient for delivering energy to the cranks, so the DeltaRunner2 becomes a powerful moving machine, capable of carrying huge loads across town, up hills, or over rough terrain. We are all about recycle and reuse, so this DIY Delta Trike Plan encourages using the parts you have on hand, as well as salvaging bicycle components from old bikes when you have them. Nothing on this trike is difficult to make, so anyone can build it. Independent Transmissions and Comfortable Seats. Each rider has his or her own set of gears, which are controlled using standard bicycle shifters and cables. 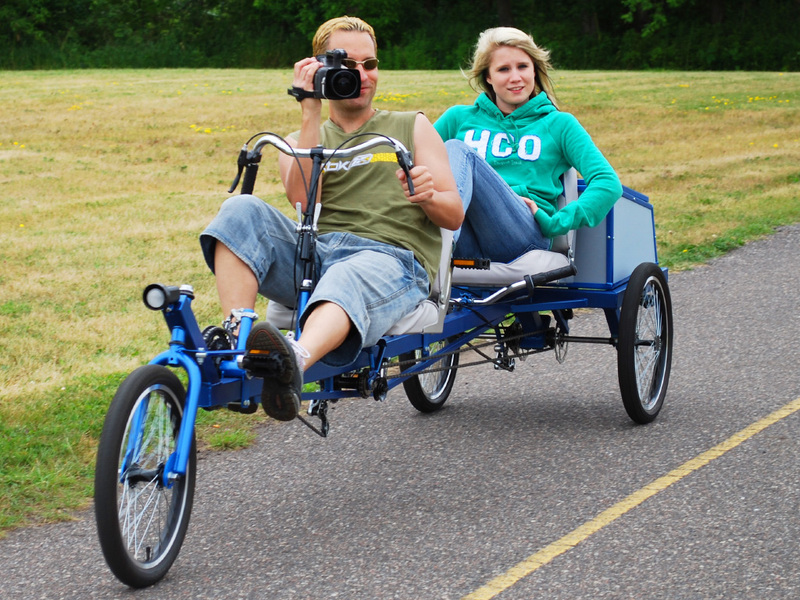 Almost all of the parts on this DIY tandem cargo trike are inexpensive bicycle components, so you can build your own cargo trike using salved bicycle components or parts found at any bicycle shop. The rear transmission only requires one simple machined part which can be made inexpensively at any machine shop or on a small home lathe. Our DIY Cargo Trike Plan is made for everybody. 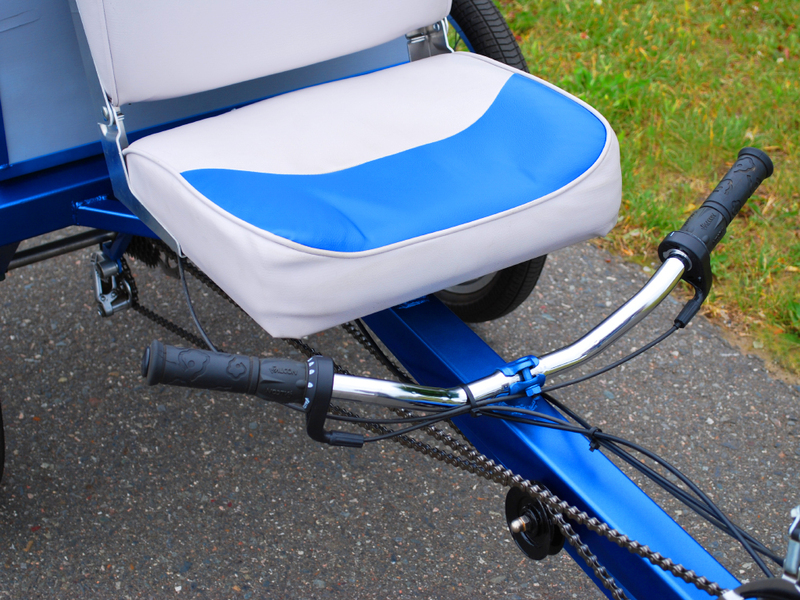 The entire trike frame is made of lightweight mild steel tubing and designed in such a way as to be extremely strong and durable for a lifetime of service. Square tubing makes it easy for anyone to cut with an angle grinder or hack saw. One Vehicle With Two Human Powered Engines. Using standard bicycle shifters, derailleurs and cranks means that the LodeRunner2 offers a full range of gears, including a very low hill climbing gear that will let you ride up any size hill with minimal effort, even with a massive load in the cargo box. As a team effort, your pedaling power is doubled, so pushing any amount of cargo around town is a very efficient and fun method of transportation and exercise. Save a bundle on fuels costs! 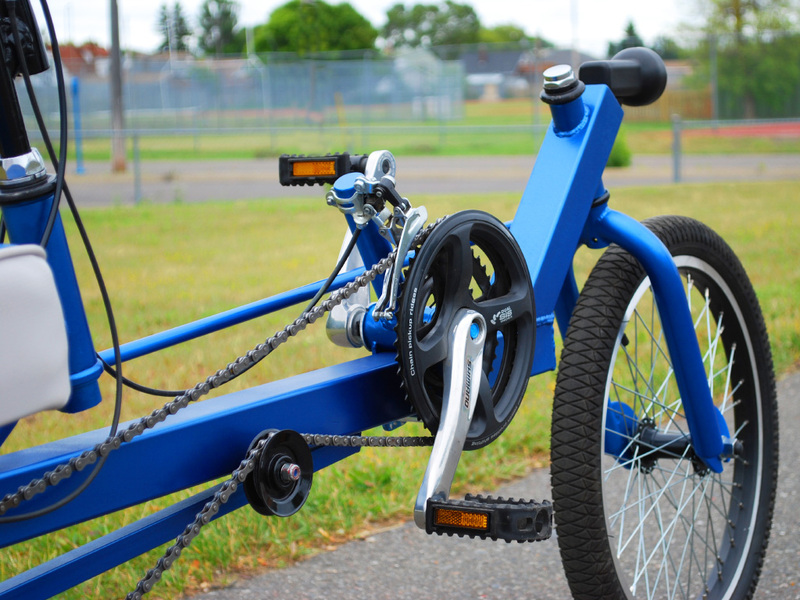 Also included on this DIY cargo trike is a dual set of adjustable bottom brackets so both riders can set the cranks to the proper position for their leg lengths. With just a turn of a wrench, the craks can be adjusted easily to riders of any size. The Removeable Cargo Box Secures Your Stuff. 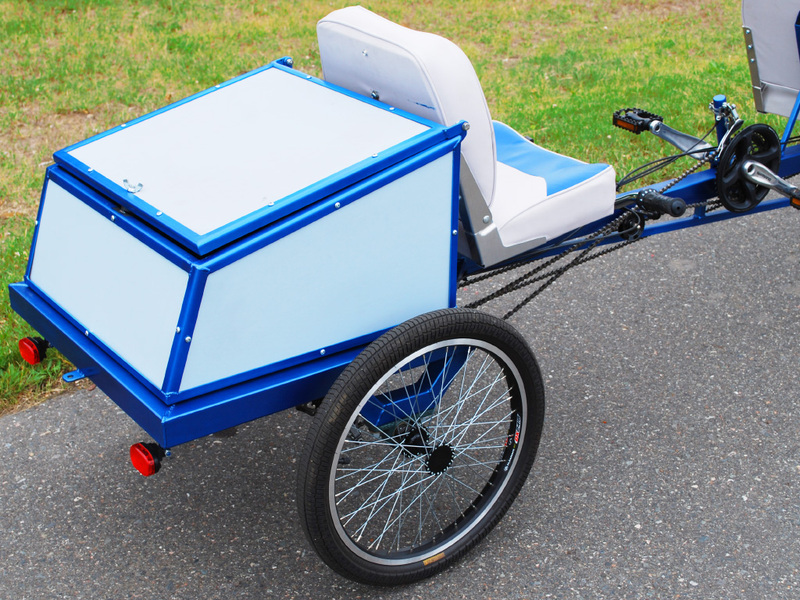 Included in this DIY Tandem Trike Plan is a robust cargo box that can carry a few hundred pounds easily. Bring home your groceries, or pack your camping gear for that long wilderness adventure. The cargo box is also removable so you can run your Tandem Trike in flat deck mode for moving huge heavy items like a fridge or stove when you buddies ask for help on moving day. 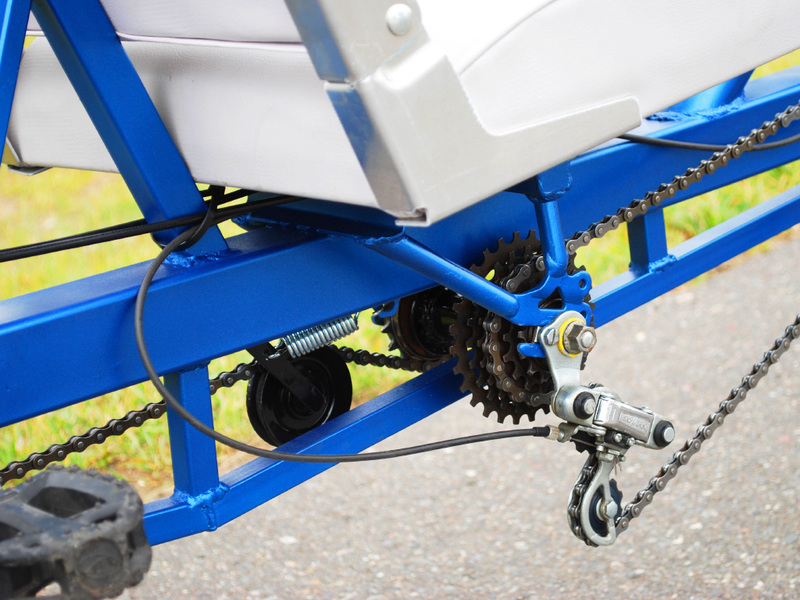 The chain drive transmission is made form commonly available bicycle parts, and all shifters and levers operate the same way as they do on your regular bicycle. Dual rear bicycle disc brakes offer plenty of stopping power when you are moving heavy loads. Get in Shape While You Get Things Done! Human power is a fun and healthy alternative to the gas guzzler, and certainly a more enjoyable method of travel. So, jump on board with your riding partner, and leave that car sitting in the driveway more often! You can cancel that gym membership! Steering components can be made inexpensively using hardware store parts and basic steel tubing. Every part of this trike can be made on a minimal budget by anyone with a desire to build something amazing. No experience necessary. Turn Those Old Bikes Into Something Amazing. Almost all of the moving parts can be salvaged from old yard sale bikes. You can also adapt the plan to use the parts you might already have on hand. There is plenty of room for your own modifications, and you can change everything from the size of the frame, to the type of seating. The goal is to build a human powered SUV, so add your own mods, and create your own unique human powered car. Yes, even the rear hubs are extremely simple to make, requiring only a hand drill and some steel flat bar. Our DIY Plans show you how to do everything in great details, so you can learn the skills you need to build just about any type of human powered vehicle. Smooth Handling, and Huge Cargo Capacity. The LodeRunner2 is not only comfortable to ride, but it handles extremely well, with dual disc brakes and a linked steering system that will make city or country rides a breeze. There is plenty of seating room, with the option to use a boat or car seat to allow for maximum comfort and pedaling power. Consider building your own versatile DIY Cargo Delta Trike so you can leave the care at home and save a bundle on fuel costs.